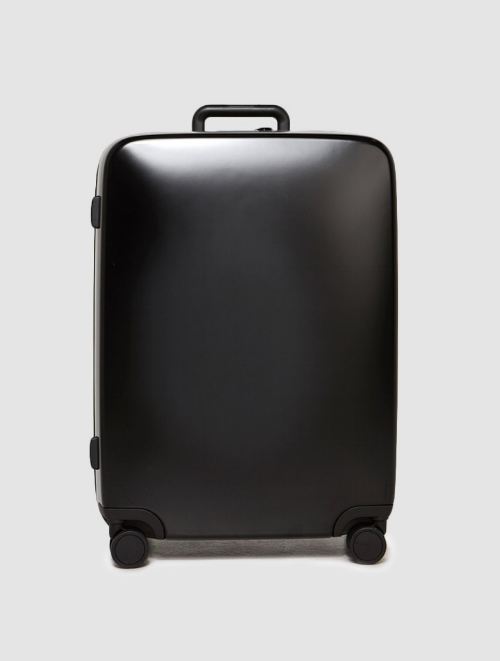 This Raden Hardside suitcase in Black Matte finish is hands down the best travel item I have ever purchased, ever. It is sleek, lightweight, beautifully designed AND is loaded up with tech. Proximity sensors use Bluetooth technology via iOS app and their cases have an integrated 7,800mAh battery along with two 2.1A USB ports to charge your devices when you are on the go.. I love that the ergonomic carry handle doubles as a scale so that I am never surprised by extra fees at the gate. It boasts a reversed zipper lining with polyurethane overlay for waterproof sealing along with a built-in TSA-approved lock. The polyester interior lining with mesh pockets, double-zippered sides keeps any packing system (if you have one) neat and accessible. The double-spinning Japanese wheel bases and polyurethane tires have 360° maneuverability and make pushing or pulling even they heaviest case effortless. After test driving this on a few international trips this winter, I bought one for every member of my family.